Many people have died in sport. Sport is more meaningful when there is a spice of danger: sport is somehow more sporting when it takes a measure of courage even to take part. It is inevitable, then, that occasionally things go wrong. Fun turns to horror and people die. Across sporting history people have drowned when racing boats or swimming. For that matter, plenty of people have drowned while fishing: no activity that deals with a lot of water is wholly safe. People have died climbing mountains, falling off horses and motorbikes, crashing cars, in accidents in cycling or in winter sports. People have even died curling: slipping backwards on the ice and cracking skulls. On the whole, when people die in sport they do so because things have gone horribly wrong. They are terrible accidents. And when they happen, sport generally resolves to try and make things safer. Sport must strike a crucial balance: it must have both a profound reluctance to waste life, and a readiness to retain the Tabasco of risk. It's not easy: a balance that must be reassessed and recalibrated with each death. Then we come to boxing. Plenty of people have died from boxing. They do so because a padded fist is a lethal weapon. A boxing glove protects not the target, the head, but the hand. Hit someone on the head without a glove and you'll break your own hand, but a good blow with a glove knocks someone out. That is to say, it causes concussion: that is to say, it causes brain damage. The head is the boxer's principal target: the causing of concussion - brain damage - is the sport's principal aim. In other words, when someone dies in boxing it's because things have gone horribly right. I'm inclined to think that this disqualifies boxing as a sport. I don't think an activity based on the trading of potentially lethal blows is really a part of the glorious and life-affirming patterns of sport. I have every respect for the brave men and women who box, but not for boxing as a public entertainment. It's not the boxers I'm judging here: it's the audience. And that is precisely why cricket has been so traumatised by the death of Phillip Hughes. It wasn't a death that came about because things went horribly wrong. It was - at least to an extent - one that came about because things went horribly right. Sean Abbott bowled what Dennis Lillee used to call "a purposeful bouncer". "I want it to hurt so much that the batsman doesn't want to face me any more," Lillee wrote. This was interesting because it wasn't one of the blood 'n' thunder quotes that fast bowlers use for the simple pleasure of overacting: a classic example being Jeff Thomson's "I like to see blood on the pitch." No, Lillee was speaking soberly and seriously about the bouncer as a tactical weapon. He was echoed by Peter Lever, after he had bowled the bouncer that felled Ewen Chatfield and caused his heart to stop beating for a few seconds. Lever said afterwards: "What I can't forget is that the ball was a deliberate short one." What happened to Chatfield and what happened to Hughes, then, were examples of what happens in cricket when things go horribly right. And that has given cricket a moral problem. Cricket has to accept that it is a violent game: that the threat and the practice of violence is part of the way it operates. And that this violence is potentially lethal. Hughes joins the party of people who died in pursuit of sport. I have known two: and it's no exaggeration to say that their faces have haunted me. One was Ayrton Senna, who on one extraordinary afternoon in Montreal talked to me of his mystical vision of himself and his sport: his desire not just to win, but to eclipse even his own achievements. He revelled in finding the limitations - of his skills and of his racing car's possibilities - and then going beyond them, so that he could redraw the map of what was possible in his sport, and in his life. It was slightly spooky: as if I had been granted an interview with the Messiah. Senna joined the company of martyr-athletes, people whose deaths have helped define sport. Senna's legacy is a vastly increased safety in the sport. These days most accidents are events that drivers walk away from. Alas, there was a terrible exception this year, and Jules Bianchi is still in a coma as I write. But at least such matters are no longer part of Formula One's routine. I met Peta Beckett, an eventer, on two occasions and rather adored her. How could I do anything else? She was brilliant, beautiful and delightful. I last saw her over a beer in the competitor's tent at Badminton, and her lovely face was lit up with excitement at the coming competition. She died in a fall a year or two later. I hated my favourite of all sport back then. There is a troubling tendency for sport to sentimentalise its deaths. There is a monument to Tommy Simpson halfway up Mount Ventoux, at the point where he collapsed and died during the Tour de France in 1967. His last words were not "put me back on my bike", but that's the story that's remembered. The fact that he was tanked up on amphetamines and brandy hasn't destroyed the legend. Far from it. That's an important part of it: Simpson has become an archetype of the insane will to win: a man who willingly gave his life to the pursuit of a distant sporting goal. The sordid reality is that he destroyed himself with drugs: a tradition that has hardly gone extinct in modern cycling. When Vancouver held the Winter Olympic Games of 2010, they adopted a hyper-aggressive campaign under the slogan Own the Podium. Everything that could be twisted to provide an advantage to local athletes was twisted. Example: they only gave limited access to the sporting venues to non-Canadian athletes. This included the luge track - and here a Georgian luger, Nodar Kumaritashvili, was killed in practice. It was said that the track was not dangerous, and yet it was significantly altered after the accident. And there were suggestions among athletes, coaches and administrators that there was a link between Own the Podium and Kumaritashvili's death. It was an embarrassment to Canada, for all that the big questions were never raised officially. Kumaritashvili's death made it very clear that major sporting events are about rather more than the self-esteem of the host country. A host has a duty to be hospitable: a host should treat a great event as something bigger than a local benefit. It wasn't clear that this lesson had been taken to heart when Russia held the Winter Olympics in Sochi last year. Deaths in sport always have a powerful impact on the sporting world. They cause us to question the current balance of risk and safety, and to ask the still bigger question: is sport worth carrying on with? Such times of self-examination are important, and most of us tend to come to the conclusion that it is. I don't suppose many of us really want to live in a world in which people aren't prepared to face fast bowling, kick horses into a gallop, press or twist the accelerator a tad more firmly, and sail as close to the wind as possible, literally and metaphorically. We are not to be tamed out of existence and made a slave to our own safekeeping. Sport is different to those pursuits that are pure and sometimes involve irresponsible risk. BASE jumping is an obvious example of this: an activity that demands little skill, and courage of a rather unnatural and disturbing kind. Sport is deeper and more complicated than an adrenaline rush. Sport's martyrs line the pathways of sporting history. Sometimes they mark the point at which sport thought again and reinvented itself: sometimes they mark points of despair, when it seems that human nature is ultimately unimprovable. Senna's legacy is a much safer sport. Simpson's legacy is a sport that has been riddled with drug scandals ever since. Kumaritashvili's death asks questions about sport, politics and money that will never be properly answered. 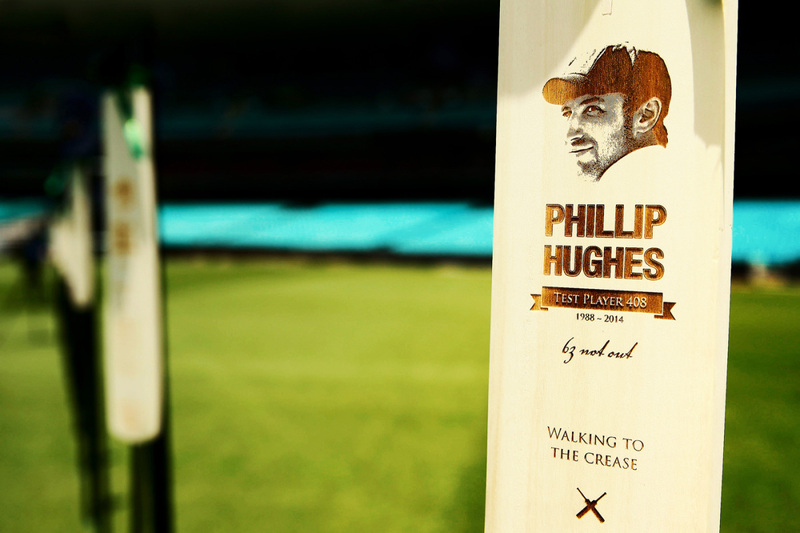 It remains to be seen what Hughes' death will do for cricket. Perhaps all that is necessary is the prosaic addition of neck protection to the helmet. Batsmen will still want to take on the short ball; bowlers, after a decent interval, will persuade themselves to bowl it. Meanwhile cricket must continue to worry about being a sport that can cause serious injury and death when things go horribly right. It must seek to find the right balance between risk and responsibility: between recklessness and courage. Remembering all along that without courage there is no sport.